Validating the chemical literature heritage. Eudesma-1,3-dien-6,13-olide. The key element of this synthesis is described as the photochemical ring-opening of 10 to give a thermally unstable ten-membered ring compound 13, which at room temperature recyclizes to 16. These two reactions constitute perfect examples of the Woodward-Hoffmann rules, a modern statement of which is that a 4n+2 electron photochemical pericyclic reaction (for the above example, n=1) normally proceeds with one antarafacial component whilst a thermal one proceeds with only supra facial components (a more recent extension of this statement would be the rule for two antarafacial components). To illustrate this, shown below is the thermal cyclisation of dimethylhexatriene as a model for 13. The IRC shows one interesting conformational feature at ~+8, which is the rotation of the two methyl groups to replace the eclipsed by a gauche orientation. Clearly visible is the suprafacial component (the new bond forms on the bottom face of both termini of the triene) and in the example of 13 → 16 resulting in the observed stereochemistry. Thermal electrocyclic reaction of a dimethyl-hexatriene. Click for 3D. The photochemical reaction of 10 can be illustrated by the nature of the conical intersection where the singlet (S0/S1) surfaces touch. 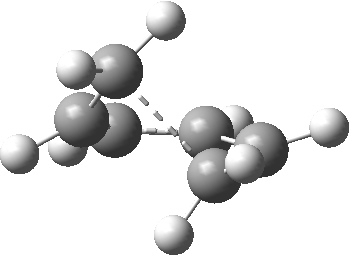 The antarafacial component is clearly seen (bottom face of lhs of the triene, top face of the rhs of the other end of the triene), leading to the observed stereochemistry of the photochemical product 13. Geometry of a conical intersection for photochemical electrocyclisation of hexatriene. Click for 3D. So Corey had in his hands in 1963 an unambiguous and clear cut example of stereoselection operating in a pericyclic reaction, and an opportunity in 1965 (if not earlier) to infer and declare a general guiding principle from that reaction. In fact that opportunity was not taken by Corey, and he was left to rue decades later on what might have been! This entry was posted on Tuesday, December 6th, 2011 at 1:28 pm and is filed under Uncategorized. You can follow any responses to this entry through the RSS 2.0 feed. You can leave a response, or trackback from your own site.